It’s just a bit over two weeks until the Fourth of July fireworks show brings thousands of people to Eastlake, Gas Works and Lake Union for the day. Officers from the Seattle Police Department say their plans for traffic control and pedestrian access in Eastlake remain essentially unchanged from last year. As SPD Officer Chris Kelley told a public meeting last year, their goal is to limit vehicle traffic west of Eastlake Avenue to the water to try to control the number of people in that area. Kelley told the Eastlake meeting last year that the best time for Eastlake residents to have guests arrive was 6 to 7 p.m. and the best time to leave was after 11 p.m. That advice hasn’t changed. The fireworks show begins about 10 p.m. and will last for 21 minutes, according to the show’s producers. I’ll write in more detail about traffic plans closer to the Fourth. For now, refer to last year’s post for details. The attached PDF shows all the closures and no parking zones at a glance and can be printed or forwarded to your guests. 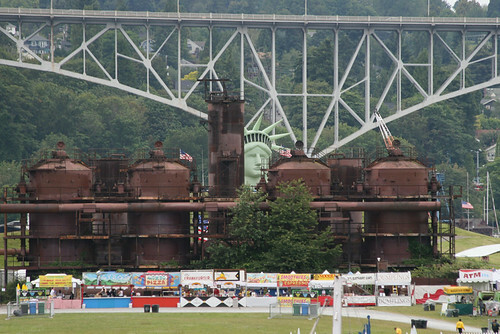 In addition to the fireworks and activities at Gas Works Park (music, food, kids events), the Wooden Boat Festival will be ending its five-day run at Lake Union Park at the south end of the lake. You’ll be able to tour historic boats, build toy boats, take free boat rides and see a 24-hour boat-building challenge. There will also be live music. Get all the details at the Wooden Boat Festival’s website. New this year will be an interactive history tour of lake Union built around the Cheshiahud Lake Union Loop. Participants will walk the loop with special game maps highlighting 15 History Trivia stops. Read the clues at each stop, write down your answers and turn in your map at either Gas Works or Lake Union parks to be entered to win two three-day Gold Passes to Bumbershoot. 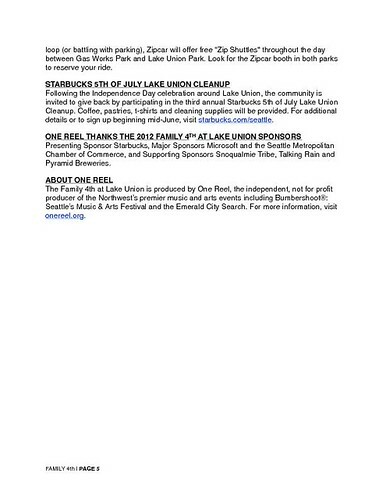 Starbucks, the presenting sponsor of the Family 4th, will be helping to clean up on Thursday, July 5. 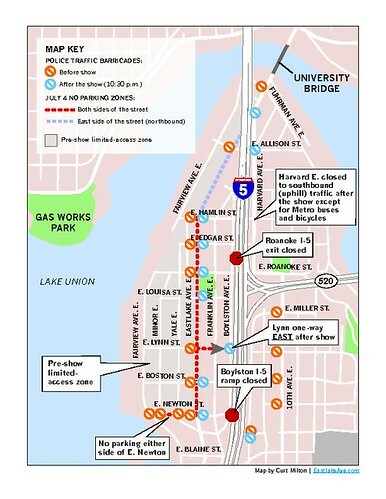 Volunteers will gather at Gas Work and Lake Union parks starting at 9 a.m. on July 5. There will be coffee, pastries and t-shirts. Theyll have all the supplies you need to help with the cleanup. Space is limited so register in advance at Starbucks’ website. I’ll be posting a list of Eastlake merchants who will be open on the Fourth later in June as well as more detail on traffic plans. If your Eastlake business will be open, please let me know at curtmilton@comcast.net. This entry was posted in Uncategorized on June 17, 2012 by cdmilton.